I’ve been experimenting with the anticlastic technique and have moved on to trying it out on earrings. 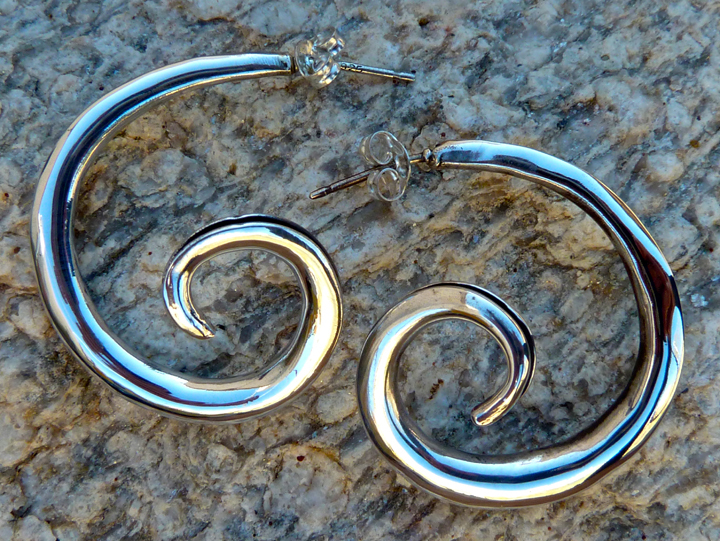 These earrings are hand-hammered and shaped into a ram’s horn spiral. Very modern and very dramatic! SOLD – may be made to order. Click here for info ordering info. Hi Matagi, Do you still remember me?? September 2001 your visit (with Thomas) to The Netherlands (Rotterdam- Maria and Leo). I was your driver, Trudi. Great time at the beach. I visited Camp Verde a few years later with Karl (my husband). I like the art you’re making. The photo’s taken by Holly are great too, I think she’s a gift. With warm regards, for both of you. Yes, of course I remember you. it was a wonderful time by the beach. Thank you, I really enjoy making art and yes Holly is a gift. Any plans on coming back to the states?